In an alternate timeline, the Porsche 911 may have lost its crown as the brand’s halo car circa 1972, replaced by a high-performance 914 variant called the 916. History records a different outcome, but on February 8, the car that might have altered Porsche’s story — the 1971 916 prototype nicknamed “Brutus” — crosses the auction block in Paris, France, part of Artcurial’s Retromobile 2019 sale. The gestation of the Porsche 914, a joint venture between Porsche and Volkswagen, was a long and painful one. At several points during the car’s development, differences of opinion between the companies nearly led to its demise, but in 1969 the air-cooled, mid-engine sports car debuted, powered by a Volkswagen-sourced flat-four rated at 79 horsepower. A 2.0-liter six-cylinder version, dubbed the 914/6, was also available and increased output to 109 hp. Though the 914 was a light car, weighing less than 2,200 pounds with the flat-six engine, 109 hp wasn’t enough to make it a serious performer. Worse, the strengthening Deutschmark meant that prices for the 914/6 models in export markets were high: In 1970, a 914/6 cost $5,999 in the U.S., while the base 911 T coupe stickered for less than $500 more. The four-cylinder 914, priced here at a more attainable $3,595, proved to be the brand’s most popular model, outselling the 914/6 by nearly 5:1 in 1970 and nearly 37:1 in 1971 (both worldwide figures). To increase overall 914 sales, Porsche believed that a more powerful variant was needed. Coincidentally, Ferdinand Piëch, the Porsche executive who’d championed the 914 project, was due a new company car, so work began on creating a more powerful 914/6 that would serve dual duty as his daily driver and as a rolling testbed for a model to be called the 916. Chassis 9141430195, a 914/6, was pulled from the production line and modified specifically for this project. While other 914 models used a removable Targa roof panel, the 916 prototype used a steel roof, welded in place to add rigidity. Underneath, the floor was reinforced for the same purpose, and fender flares from the 914/6 GT were added to accommodate 7-inch Fuchs wheels and 180/70 VR15 tires. The front bumper cover — designed by Porsche’s Studio — featured an integrated air dam and was painted to match the body color (as was the rear shroud). Underneath, the car received the four-wheel vented disc brakes from the 911S, front and rear anti-roll bars, stiffer springs, and Bilstein shock absorbers. In place of the 2.0-liter engine, Porsche first installed a 2.6-liter flat-six but later replaced it with an even stouter unit, a modified version of its 2.8-liter 911 RSR racing engine. In stock form, this produced 308 horsepower and 217 pound-feet of torque, but it wasn’t in Piëch’s nature to accept off-the-shelf parts. Instead, the engine was enlarged to 2.9 liters and, as Basem Wasef wrote in the August 2018 issue of Porsche Panorama, modified to produce a reported 345 horsepower. It was Piëch’s wife, Corina, who coined the Brutus nickname, not for the car’s performance (which surely must have been eye-opening), but reportedly for its take-no-prisoners looks. It isn’t clear how long Ferdinand drove the car — since he transferred to Audi in 1972 — but Brutus remained in the Piëch family, serving as a daily driver for Corina, whose name is emblazoned in gold script across the glovebox door. On more than one occasion, Corina was said to have visited Porsche design head Tony Lapine, requesting an update of the car’s interior. Brutus left enough of an impression on Porsche management that ten other prototypes were ordered. As with Brutus, these cars received a welded steel roof, reinforced floor, fender flares, and color-matched front and rear fascias, plus the suspension components from the 911S and 15 x 7-inch Fuchs wheels with spacers to further widen the track. 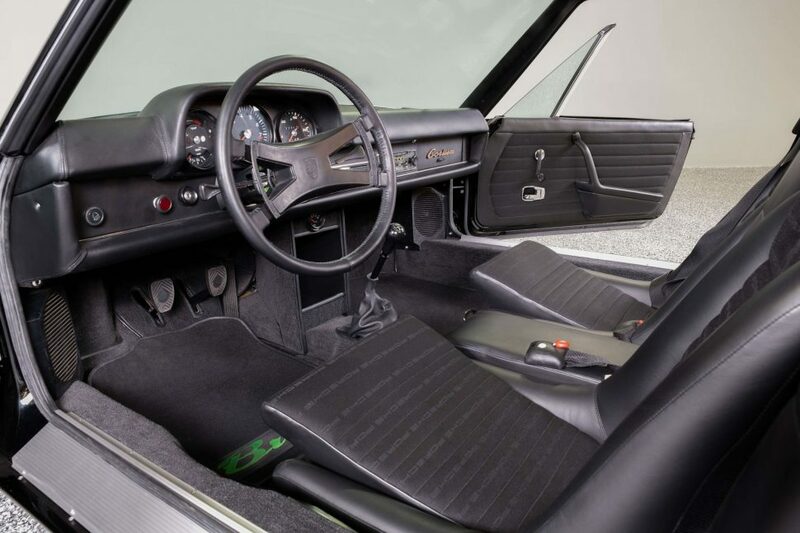 Inside, the 916s received interiors with leather trim and padding, and one car, bound for Peter Gregg, a noted Porsche racer and owner of Brumos Porsche in Jacksonville, Florida, was even equipped with air conditioning to cope with the state’s tropical heat. None of the other cars received the same engine treatment as Brutus. Instead, the production prototypes were fitted with either the 2.4-liter flat-six from the 911S (rated at 190 hp) or the 2.7-liter flat-six from the 911 Carrera (rated at 210 hp). Even with the smaller engine, the 916 was capable of running 0-60 mph in under 7 seconds, on the way to a top speed of 145 mph, while the 2.7-liter cars were said to be capable of reaching 150 mph. The 916 was scheduled to debut at the 1971 Paris Auto Salon in October, but, two weeks before the show, Porsche killed the 916 project and halted production of the car. In the end, it came down to economics: With the strong Deutschmark, tariffs on imported cars, and labor costs associated with such a low-volume model, Porsche envisioned a selling price in the U.S. between $14,000 and $15,000, at a time when the most expensive 911 — the 911S Targa — sold for $10,230. The 916’s primary rival, the Ferrari Dino 246 GT, carried a sticker price of $14,500, but that was perceived as a far more prestigious car than a Porsche 914. Without a shot at selling the 916 in volume to its largest market, moving forward made no financial sense. Given the car’s pedigree, Artcurial predicts a selling price between €800,000 and €1.2 million ($904,000-$1.36 million) when Brutus crosses the auction block in Paris. For additional details on the 2019 Retromobile sale, visit Artcurial.com.